Protect your cloth diapers...line them with fleece! Many diaper creams are not safe for use with cloth diapers. They contain ingredients that will leave a barrier on the fabric of your diapers. This can lead to build-up, repelling, and leaks. You'll need to strip your diapers to get the cream out and in the worst cases, this can be a lot of work. So, what do you do when you have to use a diaper cream that isn't cloth diaper safe? Do you have to ditch your cloth and switch to disposable diapers? No! Fleece liners to the rescue! Fleece liners can be used a barrier between the cream and the diaper. This will prevent the cream from coming into contact with your diapers. For best protection on your diapers, we recommend using 2 liners at once. It's important to remember not to throw the fleece liner into the diaper pail after a diaper change. You'll want to wash it with other laundry, like towels. Using a diaper cream, even ones that are considered "cloth diaper safe" can void the warranty of many diapers. So be safe and use a liner (or two)! Fleece liners are also great for babies and toddlers with sensitivities to natural fibers or don't like the feeling of being wet. If you are using a diaper lined with a natural fiber or one that doesn't wick away the wetness, lay a fleece liner on top of the diaper. The fleece will keep your baby feeling dry. Knickernappies fleece liners are made with a single layer of microfleece. 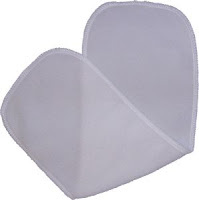 They work well with any style of diaper, are reusable and are a steal at only $1.99! I use liners, but after a few months, the liners started repelling... what is the most effective way to strip the liners?